A firefighter keeps watch Thursday on the Holy Fire, which has ravaged the Cleveland National Forest in Lake Elsinore, Calif. Authorities say they believe Forrest Gordon Clark, 51, is the arsonist who set the forest ablaze. 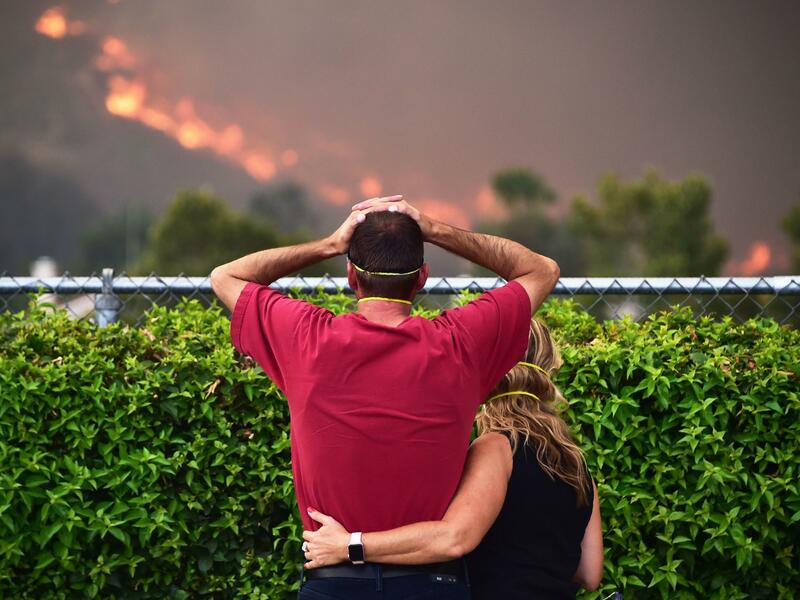 Ziggy Torok and Starla Affatati watch helplessly Thursday as the flames of the Holy Fire close in on Torok's home in the Rice Canyon neighborhood of Lake Elsinore, Calif.
Flames engulf a hillside Thursday in Lake Elsinore, Calif. Firefighters say the blaze, which has burned through more than 10,000 acres and forced the evacuations of 20,000 people, is just 5 percent contained. 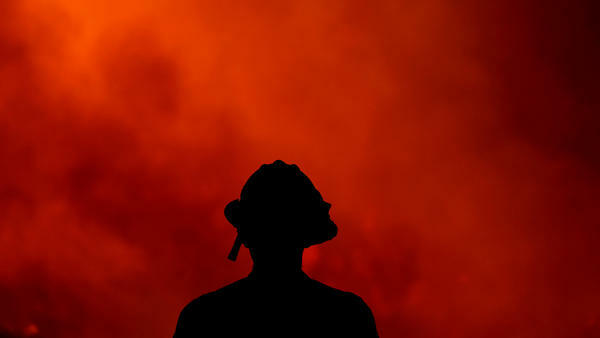 A firefighter looks on as the Holy Fire consumes a hillside Thursday in Temescal Valley in Corona, Calif. Since the Holy Fire ignited Monday in Orange County, Calif., the blaze ravaged more than 10,000 acres, destroyed at least 12 structures and forced more than 21,000 people to evacuate their homes by Thursday night. But amid all these grim and rising numbers, California's Department of Forestry and Fire Protection has listed just one cause: "human." Earlier this week law enforcement identified that human, arresting Forrest Gordon Clark on two counts of felony arson, one count of felony to terrorize and another count of misdemeanor resisting arrest. The 51-year-old Trabuco Canyon resident now faces the possibility of life in state prison. Holy Jim volunteer Fire Department Chief Mike Milligan, 71, explained why. "For us it's disappointing, because he is just a scourge on this canyon," Milligan told local media. "Every single person in this canyon is afraid of him, No. 1, avoids him, No. 2, and knew he was going to do something crazy." He described Clark as an erratic, dangerous personality he had flagged to state and federal officials repeatedly — once, according to Milligan, even ending one of those emails with a warning, "If you don't do something he's going to kill somebody or burn something down." And Milligan showed CNN a recent string of profanity-laden texts he said he received from Clark two weeks ago, capped with a threat: "Its all gonna burn just like u planned!" "This is a monster," Orange County Supervisor Todd Spitzer said at a news conference Wednesday. "Who would go out with low humidity and high wind and the highest heat temperatures this time of the year and intentionally set the forest on fire?" Clark is being held on $1 million bail. He is expected to appear in court Friday. Meanwhile, California Gov. Jerry Brown declared a state of emergency Thursday in both Orange and Riverside counties in order to aid firefighting efforts there. It is far from the only blaze threatening the state, however. 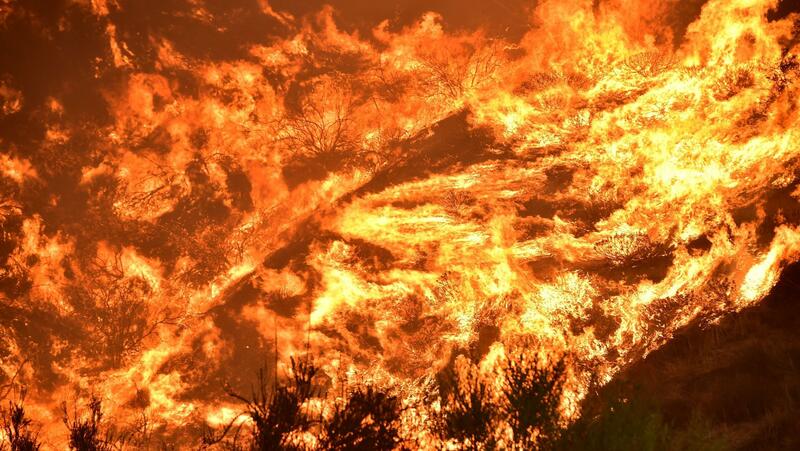 At least 17 major wildfires were burning across California on Thursday, with the Holy Fire dwarfed by other blazes farther north. That includes the Mendocino Complex Fire, which earlier this week became the largest wildfire in state history. The fire had consumed more than 305,000 acres in Northern California, or 476 square miles — an expanse nearly as large as the city of Los Angeles. After raging for two weeks, it remains roughly just 50 percent contained. Cal Fire does not expect it to be fully contained until September. A little farther north, the Carr Fire has claimed some 178,000 acres and remains just half-contained, as well. California is in "uncharted territory," Brown said at a news conference earlier this month, saying climate change is setting the state on course for a "really tough ride." "It's going to get expensive, it's going to get dangerous, and we have to apply all our creativity to make the best of what is going to be an increasingly bad situation," he added. That's an assessment climate scientists and fire ecologists agree with, as NPR's Kirk Siegler reports: "People should not take solace that this is the worst it's going to get." 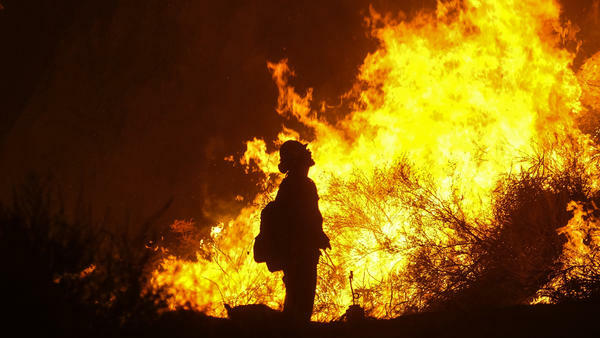 More than 1,200 fire personnel continue to battle the blaze, which is just 5 percent contained and spreading northeast, creeping farther into Riverside County and threatening some 7,500 homes. And authorities don't expect the fight to get any easier. Gusty, erratic winds and high temperatures over the weekend threaten to "increase the likelihood of extreme fire behavior."